This recipe is a staple in our household. I have tried many vegetarian chilis, but this one is definitely the best. It has lots of vegetables and is not loaded with sodium like many vegetarian chilis are–particularly the ones that use those veggie crumbles they sell in the stores. So here’s a healthy and nutritious chili that is full of “good-for-you” veggies. Feel free to switch out your favorite veggies. I had butternut squash in my fridge that I needed to use up and that turned out to be a great addition. I also always try to slip in kidney beans whenever I can since they are good for reducing cholesterol.So feel free to add what you have and what you like! The recipe is adapted from the Chili Chili Bang Bang recipe in a cookbook called “Looneyspoons” by Janet and Greta Podleski. It’s really a fun cookbook–they have several. It is out of print now, but you can still buy it on Amazon. I like to start by chopping everything you will need so it is ready to go when the time comes to add it. Place 2 tbsp olive oil in the bottom of a large pot and cook the onions, green pepper, red pepper, celery, carrots, squash, garlic and chili powder for about 6 minutes or until the vegetables are softened. Then add the mushrooms and cook for a few more minutes. Add remaining ingredients–tomatoes, beans, corn, water, cumin, oregano, basil, cayenne pepper, and red pepper flakes. Be careful with that cayenne! I usually just shake a bunch depending on my mood. It’s nice if it has just a little kick! 🙂 Stir everything together and bring it to a boil. Then cover and simmer on medium low heat for 20 minutes. Voila! 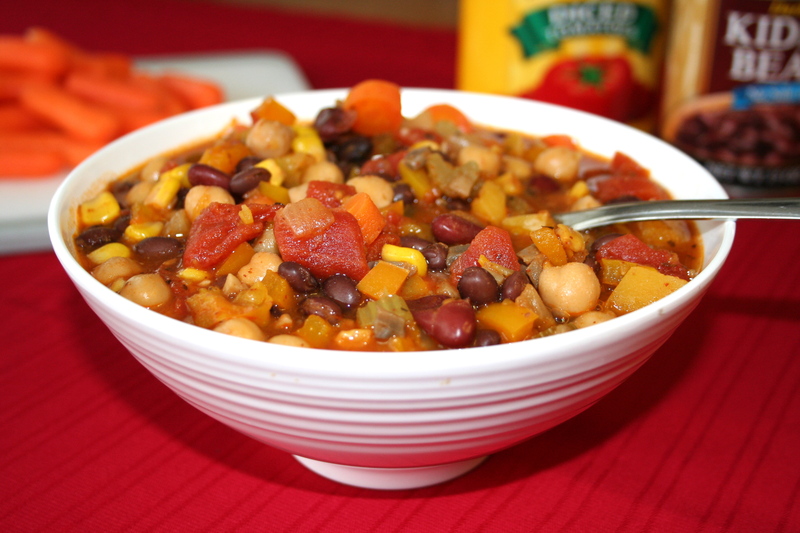 You have a delicious vegetarian chili that is good for you! This looks fast & easy, which is why I’ve decided to try it first (buying the ingredients today). As a family, we don’t like mushrooms so I’ll be using cubed tofu in place of them, and will brown it first with the onions and peppers. Looks delicious! I’ll let you know how it turns out. Hi Jill. That sounds great! I look forward to hearing how it goes! My husband doesn’t like zucchini but somehow he doesn’t seem to mind it in this chili. Looks delicious and VERY colorful!! I may have to try this for church lunch this week! Thanks for sharing today! I will definitely be trying this recipe. Looks so yummy!